The stress of preparing for a holiday can often prove worse than that of the job you are escaping from. Most of us spend weeks trawling the internet for hotel and flight offers, then try to make a week's worth of clothes squeeze into a 'hand luggage' sized bag. Not to mention the nightmare of negotiating your way to the airport with everything you need. So, with all this to contend with, how do you feel about adding a quick tidy-up to your pre-holiday preparations? Not all that excited I imagine! So we ask - Should you take time out from renewing your passport and perfecting your beach body to clean your car? Let's face it, this is basic common sense. Add to that the fact that others will probably treat your car with more respect if it's in good condition, and it's pretty convincing. But if you're not won over by this, think on... not only will others treat it better but you will too. When your car is clean even you, the owner, are more inclined to keep it nice and tidy. Something not many people do, but should, is take photos of their vehicle before they leave the car park. Snap a few shots from various angles. Should it come to the unlikely, but possible, situation that you need the photos as evidence then at least let the court or the insurance company see photos of your gleaming, well kept car! Last, but certainly not least, is the feel good factor. You've spent days sleeping in a different bed, in a different room and, for all that you have enjoyed it, you are looking forward to the creature comforts of home. It all starts when exhausted and already feeling the post holiday blues, you load your luggage into your car... make sure it's a car you want to get into! Car parks are filthy places where cars belch out fumes and coat everything with a layer of grime. And that's if you are lucky enough to get an indoor space. If not, you have the elements to contend with. 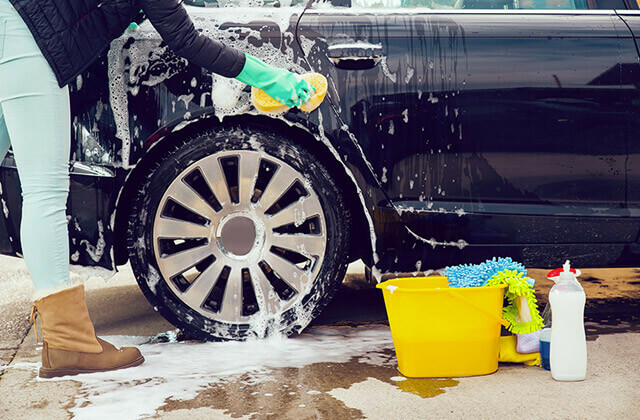 Is there any point in cleaning a car you know will be dirty on your return? This sounds lazy, but is it? Don't you want to spend your time getting ready for your holiday... how often do you get to go away? Don't you want to spend that money on a cocktail on the beach as you watch the sunset instead of on your car? It has happened and it could happen to you. Imagine - you have been working out to get in shape for your holiday for months, you have bought new clothes, you are prepared and raring to go and then, cleaning your car, your long dreamed of holiday goes down the pan. Is it worth taking the risk? You don't do anything. You simply leave your car in the car park and stipulate that you want it cleaned for your return and - hey presto - it happens. Yes it does take some preparation - you have to reserve before hand - but compared to the hassle of doing it yourself, this is nothing. Start with a nice soft sponge – you don't want to end up doing more harm than good. Avoid a kitchen detergent. 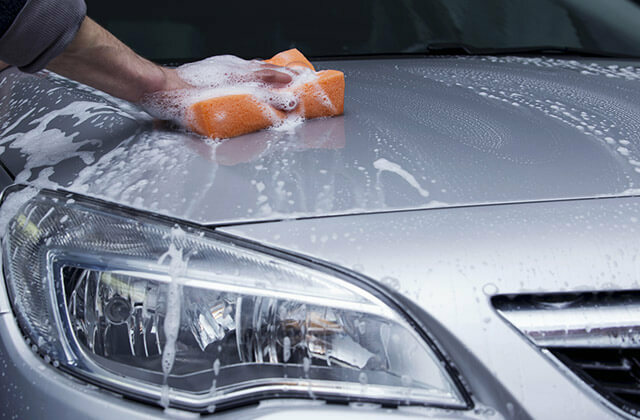 The idea is to wash with a solution that lubricates so that scratching the vehicle is avoided. Use two buckets to avoid swirls. One soapy, one clean. Before reaching for your soapy bucket always rinse your sponge in the clean water. For stubborn stains use your sponge but soak it in warm water for a few minutes to make sure any scrubbing doesn't damage your paint work. Ready to rinse? Reaching for the power hose? Don't! Free flowing water provides a much better effect.